Director Shinichiro Watanabe, of Cowboy Bebop, Samurai Champloo and Kids on the Slope fame, directs Terror in Resonance (Zankyō no Teroru), possibly one of the best-looking anime TV series I’ve ever seen. Actually, everything about the production values onscreen here is incredible. The animation is of the kind of quality you usually associate with films, rather than TV shows, whilst the soundtrack is fantastic. Watanabe’s direction, in particular, is stunning. At the end of the day, however, the narrative lets the show down. 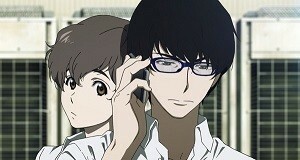 Set in present day Tokyo, Terror in Resonance is about two young men, Nine (Kaito Ishikawa) and Twelve (Sōma Saitō) who have committed to conducting acts of terror on the unsuspecting Japanese public. Through a chance meeting, socially isolated schoolgirl Lisa Mishima (Atsumi Tanezaki) is drawn into their world. On the other side we have the police trying to track the terrorists down before their next attack, led by the enigmatic Kenjirō Shibazaki (Shunsuke Sakuya). The series shares some elements in common with both Death Note (Desu Nōto) and Akira, however the plot is primarily set in the real world. It asks us to sympathise with Twelve and Nine, but herein lies the first problem. Presumably to make it easier to side with them, the show is at pains to point out that no one dies at the scene of the several terrorist attacks taken out. Time and again statistics like, “37 injured, no fatalities” are bandied about, and it just feels cheap. Blowing up skyscrapers? Come on! The brilliance of V for Vendetta was its willingness not to shy away from the deadly outcome of its ‘hero’s’ actions; Terror in Resonance’s attempts to ensure we like its characters hurt the show’s credibility. Then there’s the fact that there is a grant total of two female characters. Two. And Lisa apparently has no useful skills whatsoever. She turns up, cries, wears thigh high socks and needs rescuing a lot. Forget about the Bechdel test; according to Terror in Resonance, the entire police force is male. Whenever the show cuts to police HQ, we see a good 60 officers, none of them female. Terror in Resonance – The Complete Series is available now on Blu-ray and DVD from Madman. This entry was posted in TV Series and tagged Anime, Drama, Science Fiction, Thriller, TV series by Stuart Wilson. Bookmark the permalink.